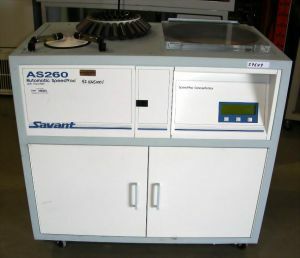 Product Description The Savant Speedvac A260 centrifugal evaporator is a automated, high-capacity floor model with all components combined in a single compact unit. Efficiently and safely evaporates large volumes of both organic and aqueous solvents, and mixtures (such as those used in drying solvents from solid phase extraction columns in QC procedures). Excellent for concentrating clinical samples for analysis and separating volatile residues, such as pesticides, from extraction solvents. All components are combined in a compact, free-standing floor unit. The large evaporation chamber accepts a wide variety of rotors, holding up to 200 tubes from <1.0ml to 250ml, as well as microtiter plates. System includes integral concentrator, rotor, 190LPM vacuum pump, -90C (-130F) cold trap with 4L capacity, cartridge type chemical trap, and oil filter/recirculator. Includes 40 place rotor & shields as shown but if you need another rotor instead, please let your sales rep know what you need so that we can see about substituting with another used rotor from stock for you.